MegaNatural® grape seed extracts are produced from an abundant supply of quality grapes, grown and processed sustainably in the heart of America’s wine country. Polyphenolics manages every step of the process, from the initial wine grape and seed selection to the final extraction of the finished material. Polyphenolics is a division of Constellation Brands, Inc., the world’s largest premium wine company. Just as our parent company strives for excellence in making premium wines, Polyphenolics strives for excellence in making premium grape seed extracts. Watch our video to learn more. Polyphenolics’ MegaNatural® grape seed extracts contain 100% grapes. Nothing more. Our unique, condition-specific products have earned four U.S. patents and numerous additional patents around the world. Polyphenolics also invests heavily in original laboratory and clinical research. It’s the only way to confirm the efficacy of our extracts. Made using a patented hot water extraction process, MegaNatural® grape seed extracts are verified to be consistent in every batch, which means consistent results in your supplement. MegaNatural®-BP is clinically shown to help maintain blood pressure levels within a healthy range. MegaNatural®-Gold has been shown to have a greater antioxidant capacity than vitamins C and E or beta-carotene. MegaNatural®-BP helps support endothelial function by maintaining healthy nitric oxide levels that are within the normal range. This helps support healthy vasodilation and blood flow. 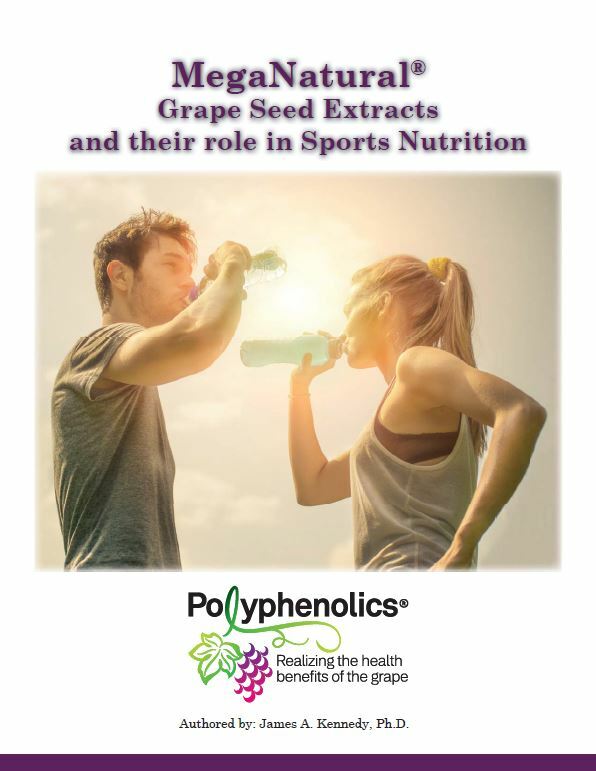 Download the latest whitepaper from Polyphenolics President Jim Kennedy on the role of MegaNatural® Grape Seed Extracts in sports nutrition. MegaNatural® grape seed extracts are special seed blends made primarily from varietal California wine grapes. Polyphenols are extracted from the grape seeds using hot water. The extract is then purified, concentrated and spray dried into powder. All MegaNatural® products are safe, non-toxic and hot water extracted. Polyphenolics has scientifically developed a patented method for producing purified grape seed extracts. Each product is rigorously tested to study its health benefits and safety. Polyphenolics uses only its own abundant supply of quality U.S.-grown grapes, and retains complete control over the entire manufacturing process from the initial selection of wine grapes and seed collection to the extraction and spray-drying of the finished material. Other grape seed extract manufacturers have variability of seed source and lack standardization. Research shows that other grape seed extracts don’t show the same specific health benefits. Buy MegaNatural® now! Shop by your favorite brand, by need or by product.